I grew up on the Colville Confederated Tribe in Washington State. The Colville Reservation is 1.4 million acres in size with 10,000 members. It is made up of 12 different bands and I’m part Arrow Lakes, San Poil, and Nez Perce of the Chief Joseph band. I left the reservation in 1985 after college and moved to California to better my life, so I would be able take care of my parents when they were old and needed care. I used to war dance when I was a child, but never pursued it as a passion until 40 years later. 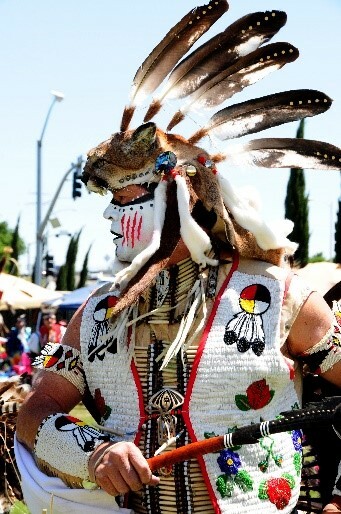 My older brother started me back to the powwow circle when he came to visit me in 2002 from the reservation. He had me sign paperwork in order to acquire eagle feathers from the Federal Government’s Fish & Game Department for his regalia. Three years later, I got my first eagle and started plucking the feathers for my brother. That same night I started having many dreams of dancing with the “Old Ones”. Since then I’ve pursued my dreams of dancing and have made 13 dance outfits. Since I am very adept at using woodworking tools, my other passion is to make war dance sticks and war clubs. 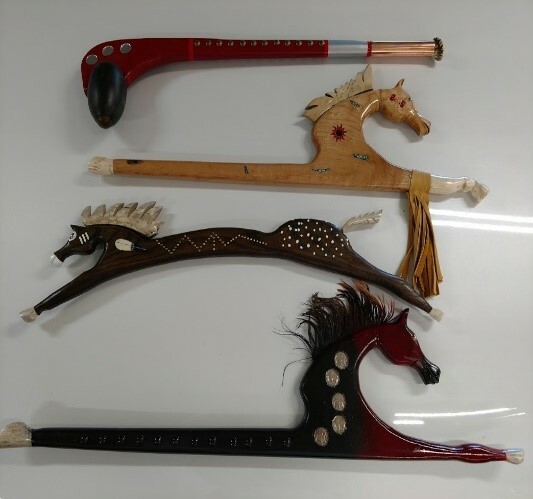 I love to imagine, design, and create new and old concepts in war clubs and dance sticks for use in the powwow circle, and for use as decorative items. I often use deer, elk, moose antlers, tacks, and turquoise inlay to embellish my war clubs and designs. My other focus is “Live Edge” tables and benches with turquoise inlay. 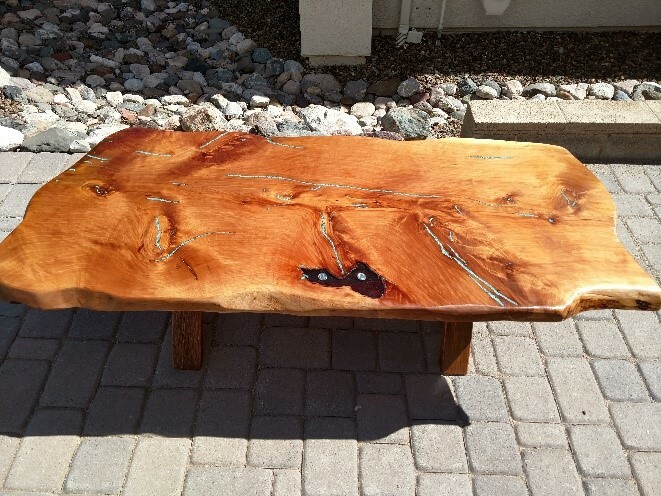 I love to see the tree’s grain come to life and see the vibrant colors pop when using natural stains on slabs of wood. I retired from working in IT in Sacramento last year, and my wife and I moved to Clarkdale in May 2018, where we are enjoying all the natural beauty that Arizona offers!